Theresa May's proposed new economic partnership with the EU "will not work", the head of the European Council has said. Donald Tusk said the plans risked undermining the EU's single market. He was speaking at the end of an EU summit in Salzburg where leaders of the 27 remaining member states discussed Brexit. Mrs May has urged them to "evolve" their position on the Irish border and back her "serious" proposals. There is still no agreement on issues including how to avoid new checks on the Northern Ireland-Republic of Ireland border. 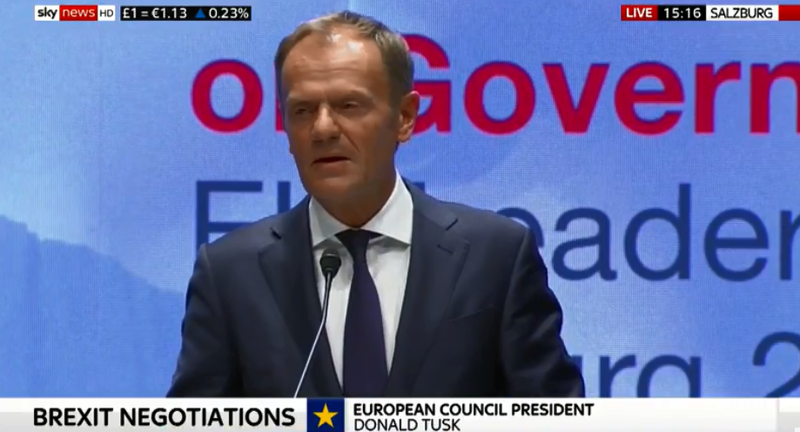 At a press conference, Mr Tusk said there were some "positive elements" in the UK's blueprint for future relations with the EU, which was agreed by ministers at Chequers in July.